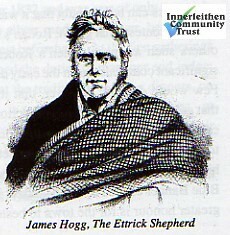 His grandson was the great Borders poet and writer James Hogg who took for his pen name “The Ettrick Shepherd”. Greatly inspired by his grandfather’s prowess, Hogg had a life-long interest in sports and athletics both as a contestant and an organiser. As a young hill shepherd he would often “toil at the leap, the race, or the stone/with none to beat but myself alone”, forever striving to set a new personal best, just to relieve the monotony of his lonely vigil in the heather. The youth who was to become inextricably linked with St. Ronan’s Border Games was employed as a shepherd at Willinslee (now Williamslee). This hill farm in the Leithen valley a little upstream from Leithen Lodge was at that time leased by a relative of his mother. Here he was encouraged by farmer’s wife Mrs Laidlaw to expand his hitherto rudimentary education by reading books such as The Life and Adventures of Sir William Wallace and The Gentle Shepherd. In 1790, after two years at Willinslee, he moved to Blackhouse in Yarrow to work. It was here Hogg heard a recitation of “Tam o’ Shanter” and he decided there and then that he, “Jamie the Poeter”, would become the successor to Robert Burns (whom he never met). That Hogg never supplanted Burns as national bard was no disgrace – for neither has anyone else! Though the attitude of the intelligentsia of the time to his work could be patronising at best, after two hundred years of virtual obscurity the literary genius of the Ettrick Shepherd has at last begun to be widely recognised and appreciated. Although remembered more in Innerleithen for his sporting connections there’s no harm in reminding folk of the town’s association with not just one but three of Scotland’s greatest literary figures – Burns, Scott and Hogg. Although now too advanced in years to participate in the more energetic games, Hogg became a first class exponent of archery, regularly winning prizes at St. Ronan’s (though not the Silver Arrow). The “green and gold” uniform he wore at the Games was that of captain of St. Ronan’s Bowmen. Hogg was also an accomplished angler. In October 1828 he was reported as winning the “salmon medal of the club” by landing a twenty-pounder from the Tweed opposite Holylee. There can be no doubt that it was James Hogg’s sheer enthusiasm for sporting contests that got St. Ronan’s Border Games up and running. That others such as Innerleithen’s Robert Boyd (the first secretary) made significant contributions in the early days of the Games cannot be gainsaid. Few would dispute, however, that it was Hogg’s leadership and vigour that galvanised those others into action. In the St. Ronan’s Border Games centenary year of 1927 John A. Anderson suggested that some memorial to the Ettrick Shepherd should be erected in Innerleithen but, like Anderson himself, the poet is unlikely to be forgotten here. Proudly etched on the Blue Banner carried by our Standard Bearer is the name of “Hogg”. What greater honour is there for the town to bestow upon him?